Yesterday, if you've been paying attention to the blog, Ed and I got married. The photo above is the only selfie we took the entire day (thankful for Ed's long arms!). We'll have more photos once MacGyver is done sorting and editing and doing whatever he does to make them perfect. I'll bore you with those at a later date. 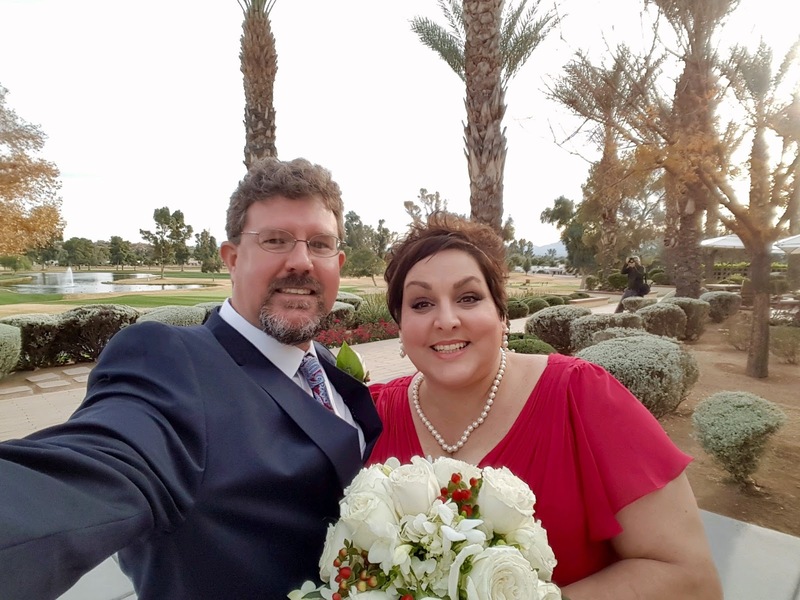 We had a small gathering of family and friends join us at the Omni Tucson National Resort for a simple ceremony and then dinner at Bob's Steak and Chop House. Our friend Marlaina wrote something to read at the dinner but then decided to hold off - I think she was worried I would cry, which I did when she read it to us later in front of family and friends. Marlaina read it like a seasoned thespian, with humor and perfect inflection. I love what she wrote and decided to share it here (for those who don't know, Toni is my mom). I’m not saying Salena is a control freak. But I will read these words from her prepared statement. Let’s talk about the two people who brought us together today -- Toni and God. For the new fremily members, Toni has a God Box. She writes the hopes and dreams and wishes of her family and friends, dates them, puts the notes inside the God Box and prays on them. So, all y’ all know that inside Toni’s God Box is a faded piece of paper, dated July 21, 2004. The official first Salena and Ed date. Thirteen years? Toni’s faith was tested. By God and by Ed. But, here we are. Couples are a mystery. How does the relationship work, we quietly ask ourselves. What really brought them together and what keeps them together. One fiery Italian babe. One laid-back dude from Texas. Salena and Ed are wrapped in different packages, but under those wrappings, they are the same where it counts - their values. They are both intellectually-curious and adventurous-spirits. They are open to new people and new experiences. Kind. Generous. Thoughtful. Salena and Ed are dedicated to family and friends. They teach each other. They learn from each other. They watch over and protect each other. There’s little flat walking in marriage, it’s rolling hills punctuated by mountains. Luckily for you, Salena and Ed, you have examples of strength and commitment. Ed’s parents Richard and Dixie have been married 43 years. Salena’s mother Toni and her departed, and much-missed, step-father Frank were married 32 years. Her brother Michael and his wife Pam married 24 years ago. One of the secrets here is, that without fail, Salena and Ed’s infectious, equally matched and complimentary senses of humor sustain them through the challenges and aggravations of daily life. Their ability to turn tears into laughter will serve them well. We all wish you, Mr. and Mrs. Godfrey, a bottomless well of problem-solving creativity. Samson-like strength to carry each other through the Valley of Annoyance. And endurance because well, couples hang in just because they have to hang in. Thank you including us in your celebration. We wish you a lifetime of happiness, new discoveries, and health.